The house is looking very bright and pristine at present as it has just had its five yearly repaint and can now be seen even more clearly from the surrounding fells! The front garden is looking very colourful and the summer planting in the pots in the courtyard is making a nice show: inevitably there are a few rogue sunflowers appearing but I tend to leave them where possible as they make me smile. Last weekend it was Margaret, my sister’s, birthday and in keeping with a long tradition going back to our childhood, she spent it here in the Lake District. 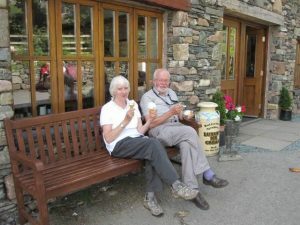 The weather was good and we had some lovely walks with an obligatory post walk ice-cream at Buttermere. No, Margaret is not eating two ice-creams, she has mine as well as it is difficult to take a photo and hold an ice-cream cone at the same time. For Margaret’s celebratory meal, we went to Overwater Hall at Ireby, which I have wanted to go to for a while but needed an occasion to do so. We had a super evening: the setting was impressive, we felt very well looked after and the food was delicious. I’m going to have to think of another reason to visit. We also went to see the ospreys at Bassenthwaite. The volunteers at the viewing stations are always so helpful and enthusiastic and we had excellent views of the parent birds and their two chicks, perching on the nest and nearby trees and watched one having a bathe in the lake. The weather, like everywhere else, has been very mixed over the past month but there have been very few days which have been unremittingly bad and there have also been some glorious days. 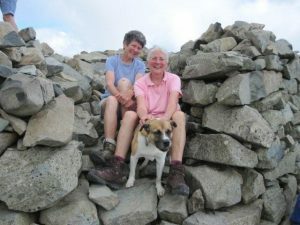 Judy and I try to take advantage of these when we can and on one such day we headed off to Seathwaite at 8am to get an early start on Esk Pike and Great End. 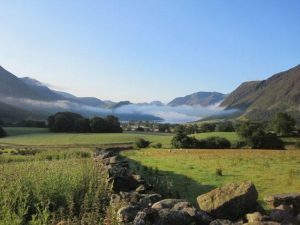 We have a reputation with our families that whenever we go walking on the fells we can’t resist a ‘while we are here ….’ Well, on this particular day, Scafell Pike looked so inviting as we sat and ate our lunch on the top of Great End, that we did the ultimate add on! It was a day to remember. The other week I travelled further afield to meet with a friend the other side of Penrith. We met to walk to St Ninian’s Church which is situated just off the A66 in a field on a sweeping bend of the River Eamont. It is said to be one of the oldest Christian sites in Cumbria and is a beautiful rather special little church. We then went on to Lowther Castle and Gardens. The gardens were abandoned seventy years ago and are now starting to undergo a major reconstruction. It is fascinating to see it at the beginning of the work which is going to take 20-25 years to complete and I think it will be interesting to make regular visits to see how the renovations are progressing as the gardens are truly lost with only traces of their former life remaining. 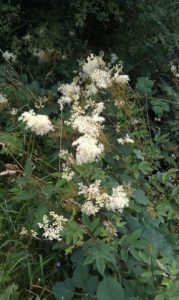 Finally, a little update on the hedgerows to finish: it has been an excellent year for meadowsweet and the harebells are looking very pretty as well – two of my favourite flowers. I also thought I would add a picture I took early one morning by the gate.